Well that was 2010, and there were no real competitors to iPad. There were some attempts like the crunch pad (JooJoo) which showed some promise but well, what can I say, you probably barely heard about it. Then there was that much awaited HP slate with windows 7 that so many people were holding off for, well, it never really saw the light of the day yet.. There was another promising concept called Adam, well, after numerous delays it just started shipping in 2011 and has it’s share of problems. the only real successful (if we can call that) was the Samsung Galaxy tab running andrioid 2.x which was really meant for phones and not optimized for the big screen. But 2011? well it looks like the competition is really heating up for real this time… here are some nice options I am looking forward to this year. 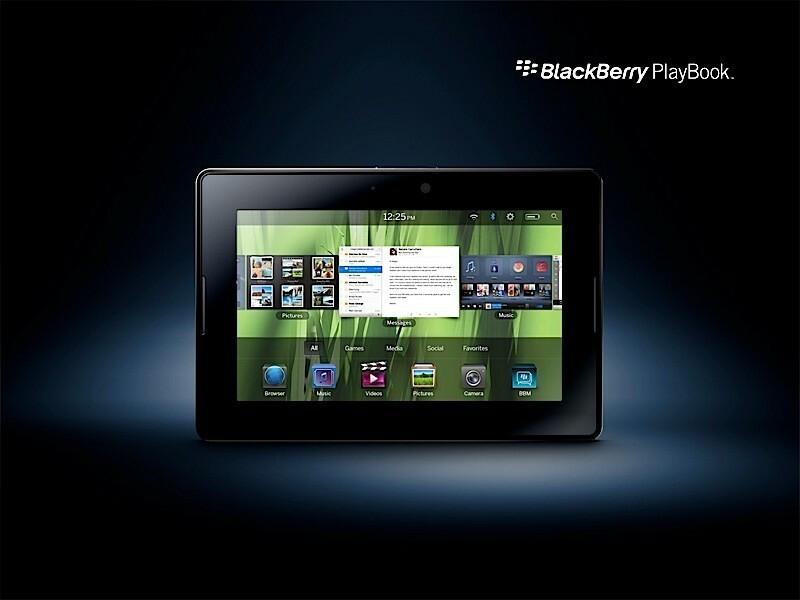 First amongst the new tablet’s from a reputed company that shows real promise is RIM’s Blackberry Playbook. It’s a 7″ version unlike most others but RIM has been promising everything you can ask for at this moment. Specs wise, it has 1Ghz dual core processor, 1GB of RAM (4 times that of current iPad), dual cameras with 1080p video recording, hdmi out and myriad of other specs considered standard on a 2011 device. On the software front, they are redoing the OS from scratch presumably the fruit of their recent aquisition QNX. It supports multitasking, HTML5 and even flash. All in all, it looks very promising if it’s not delayed and is priced right. Also, a lot depends on the king of developers and apps RIM can attract on to this platform. As for pricing, RIM is going to be really aggressive is the belief. Rumor has it that cheapest version starts under $500 here in the USA. The next announcement in the tablet sector which I think will probably be the sales king behind iPad (or dare I say, might beat iPad sales) was from Google (with Motorola) about their tablet oriented OS update to the Android, ver 3.0 codenamed Honeycomb. 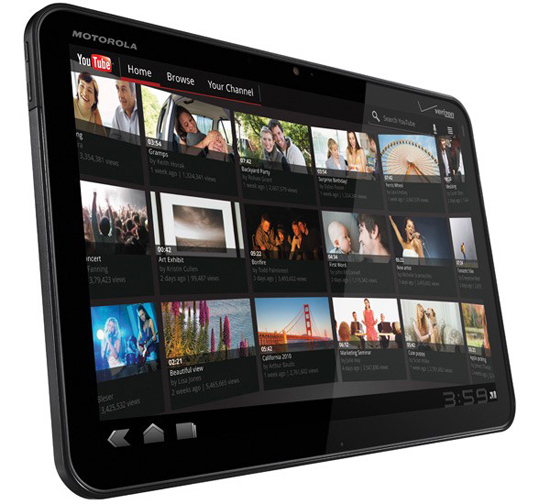 The Google experience device for the tablets was a model from Motorola named Xoom. Moto started promoting it heavily even before even releasing much information about the tablet, but since then we know pretty much everything about it. It sounds impressive on the specs front and Honeycomb looks exciting too. A few more tablet PCs were announced at the MWC today (Feb-13th) including one from Samsung with almost similar specs. Basically it looks like Honeycomb tablets all have a dual core processor 1ghz or better, 1gb RAM, 1280×800 10″ screen, dual cameras and the usual stuff. On the software front, Honeycomb looks a lot more refined and makes use of the added screen real estate very well. It supports flash as well if that’s your thing. And android being the second most popular modern smart mobile OS, there’s no shortage of Apps. Pricing for the XOOM is rumored to start at $799 which seems pricey and might be factor if it fails to succeed, but then again the beauty of Android is that it won’t be just one device, so here’s hoping that other will price their more competitively. Now the last major announcement in this segment comes from HP, which just made the much anticipated follow up to it’s acquisition of Palm and WebOS. 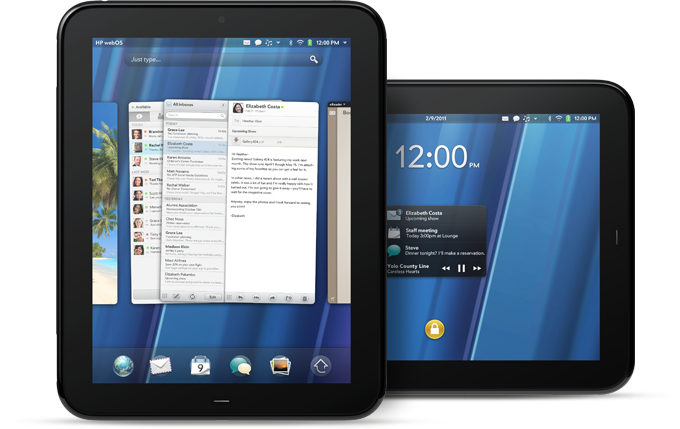 They are releasing a pair of smart phones and a tablet PC running WebOS. They are calling the tablet HP Touchpad. 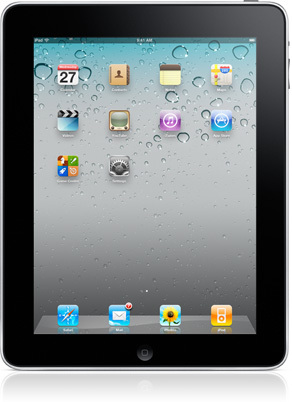 It boasts a 9.7″ (1024×768) screen and weighs 1.6lbs (heaviest among the bunch, hair heavier than the metal clad iPad 1). Other tech specs include a front facing camera for video chat, 1.2gh dual core CPU, 1GB RAM and other usual stuff which is pretty much the standard for 2011. On the software side, WebOS 3.0 will be powering this device which has been updated to make use of the bigger screen and as before it looks gorgeous. Here’s hoping that HP with it’s vast manufacturing and retail expertise will succeed where Palm failed and manages to attract more developers. Rumors suggest that the pricing start at $699 here in the US which might be asking for a bit much. The original iPad was announced over a year ago and has been out for almost a year, so obviously all the competition is really going to compete with iPad 2, which is rumored to be released any time now which probably translates to within a month. And the rumor mill has pretty much nailed the specs and so far it appears that it too will boast a dual core CPU running 1.2 ghz, 512 or 1 ghz ram, dual cameras and supposedly decreased thickness and weight….